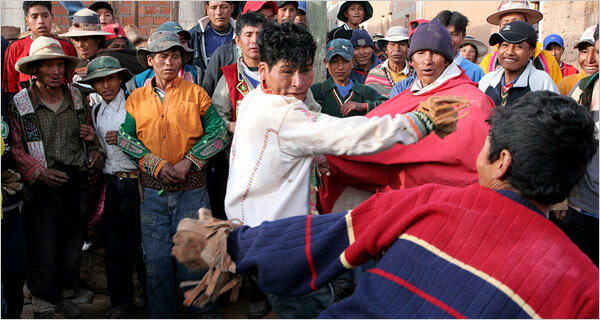 The New York Times reports on a drinking and fighting ritual still practiced by Indian communities in isolated parts of Bolivia. Known as Tinku, which means "encounter" in the Aymara and Quechua languages, the event begins with music, dancing and chica, a traditional drink made of fermented rye. It ends with groups of men fighting one another until they become bloodied and occasionally pass out. Some deaths have resulted, along with alleged incidents of cannibalism. "I do it because it’s fun," 20-year-old Esteban Lisidro Aguilario told The Times at a small Tinku in the village of Sacaca. A much larger Tinku takes place in Macha, where thousands flock every May. Tourists are charged admission fees. The Roman Catholic Church opposes the ritual and has tried to stamp it out. But Indian leaders, emboldened by President Evo Morales, the nation's first Indian president, want to preserve it. "There’s a predisposition in all of us to do Tinku," said Wilson Araoz, the mayor of Sacaca.